Copper futures traded higher on Thursday, amid expectations the Federal Reserve will sustain its bond purchases for longer and after data showed that profit growth at Chinese industrial companies accelerated in May. On New York Mercantile Exchange’s Comex division, copper futures for September delivery traded at 3.069 USD a pound during European trading hours, up 0.9% on the day. New York traded copper prices increased by as much as 1.1% earlier in the session and hit a daily high of 3.073 USD a pound. The Commerce Department reported on Wednesday that US gross domestic product increased at an annual rate of 1.8% in the three months prior to March, lower than analysts’ estimate of 2.4% growth. The disappointing data eased fears the Fed will gradually decrease its bond purchase program in the following months. The US was expected to release the weekly government report on initial jobless claims and a report on pending home sales this Thursday. Copper prices gained further support as official data showed that profits at China’s industrial companies soared 15.5% in May from a year earlier, higher than April’s 9.3% increase. As a result, market sentiment received a further boost. Comex copper prices dropped to 2.985 USD a pound earlier in the week, the lowest level since July 20th, 2010, as fears over a cash crunch in the Chinese financial system grew. 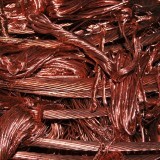 China is the world’s largest copper consumer, accounting for around 40% of world consumption in 2012. Changes in the gold and silver prices this year have largely tracked changing expectations as to whether the US central bank would end its bond buying program earlier than expected. Gold for August delivery increased 0.5% and traded at 1,236.25 USD a troy ounce. On Wednesday, gold prices fell more than 4% and touched a low of 1,221.55 USD a troy ounce, the weakest level since August 24th, 2010. Silver for September delivery increased 0.5% and traded at 18.71 USD a troy ounce. Silver futures dropped more than 5% on Wednesday and hit a low of 18.39 USD a troy ounce, the lowest level since August 25th, 2010.